Since I've been so MIA this season, I thought I'd offer you all a completely FREE download that I created for you. 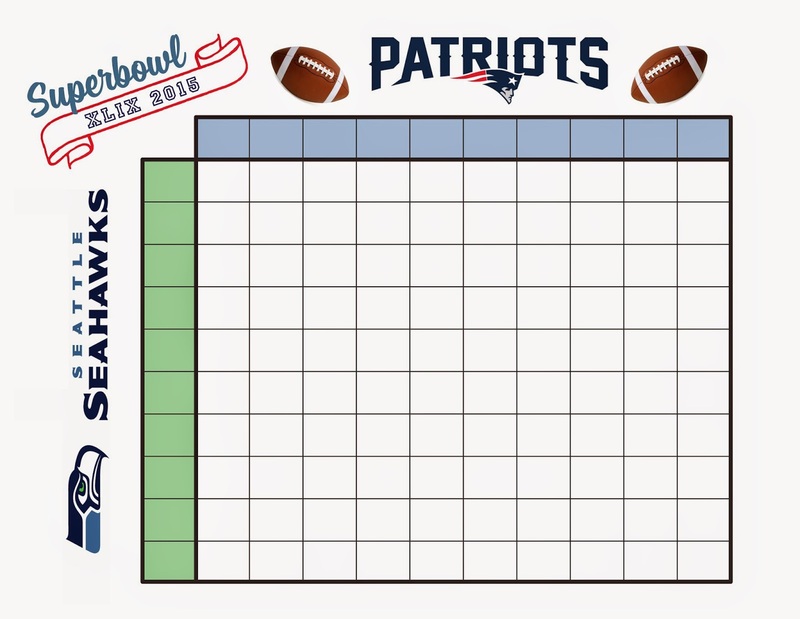 Print this out for Superbowl Sunday, have people pay a $ amount per square and fill in their initials in whichever squares they'd like (equal to the amount they paid for). Your Football Squares grid is now complete, and you just need to wait til the game is played to determine who will be your winners. A winner is usually determined at the end of the 1st quarter, 2nd quarter, 3rd quarter, and Final Game score. The winner is determined by looking at the last number in each of the teams' score, and then matching those numbers on the grid and seeing which square intersects those two numbers. So, say the score at halftime was New England Patriots was 33, and Seattle Seahawks 24. The last number for the Patriots is 3, and the last number for the Seahawks is 4. The square on the grid that has the Patriots with a number of 3, and Seahawks score of 4, would be the winner. Have fun and be sure to check out my recipes on this blog, and my Pinterest page for great Superbowl party ideas! !